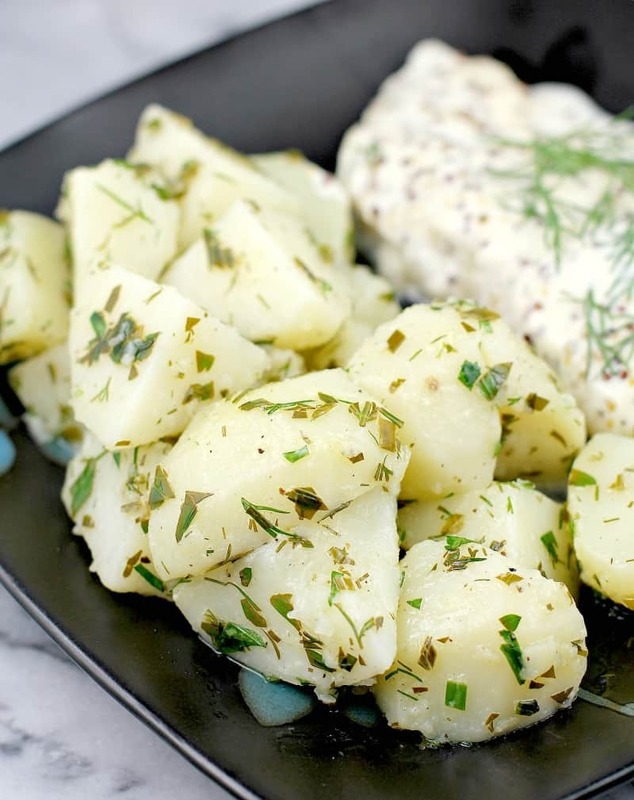 This cozy warm side dish with seasoned boiled potatoes is perfect for St Patrick’s Day or any occasion to get your Irish herbed potatoes, Irish food game on. 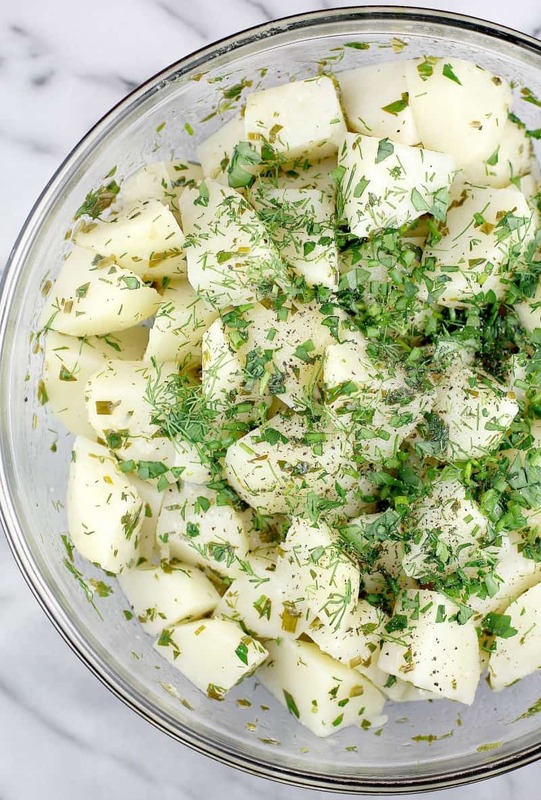 Creamy soft boiled potatoes, tossed in a lemony, buttery, heavily herbed vinaigrette, served at will to a crowd. Hey you! 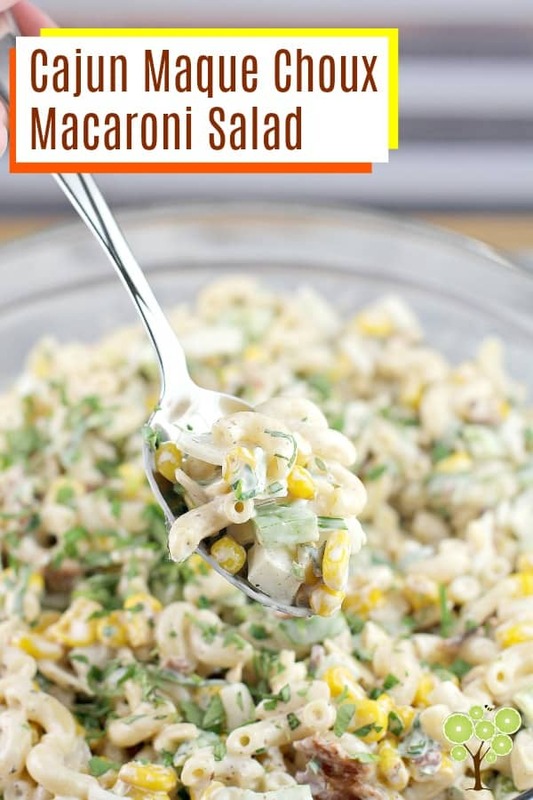 You guys that don’t like making potato salad or mashed potatoes …This recipe is for YOU! Because this is literally one of the easiest, boiled potato recipes ever, and one of the easiest potato recipes in my repertoire. The reason for why is because we simply, lightly boil potato then toss in a lemony, garlicky, very buttery herbed dressing and That. Is. It. SO easy. SO forgivable. 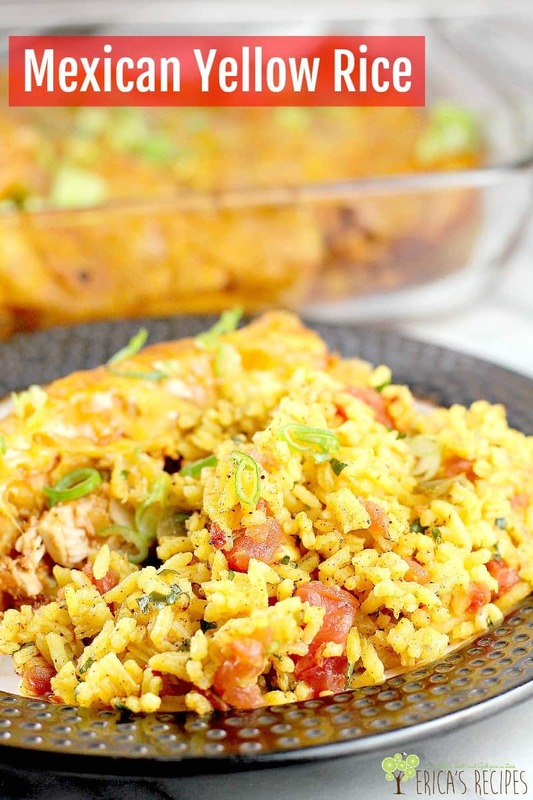 SO perfect for pretty much anything because this can be served warm or at room temperature. 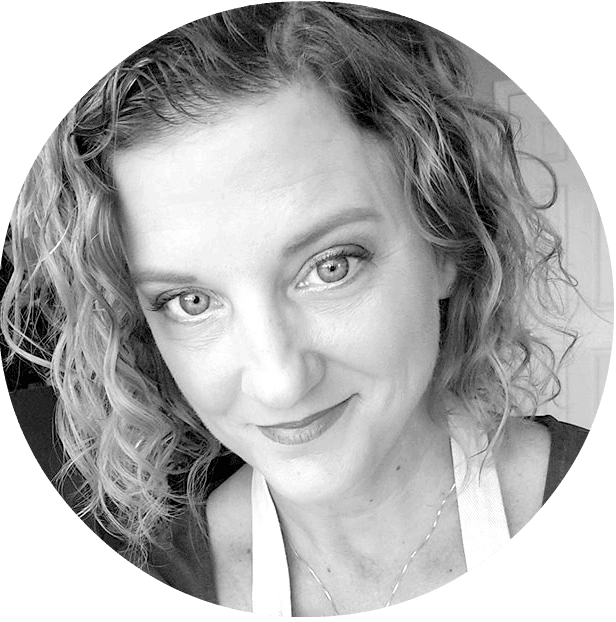 …so you can make this recipe in advance a bit, then let it sit – no worries – then cart to wherever you have to go. Do not, for the love of all of creation, overcook the potatoes. We want them to hold their shape and not fall apart when tossed in the vinaigrette, so not overcooking is crucial. Use the freshest of fresh herbs. 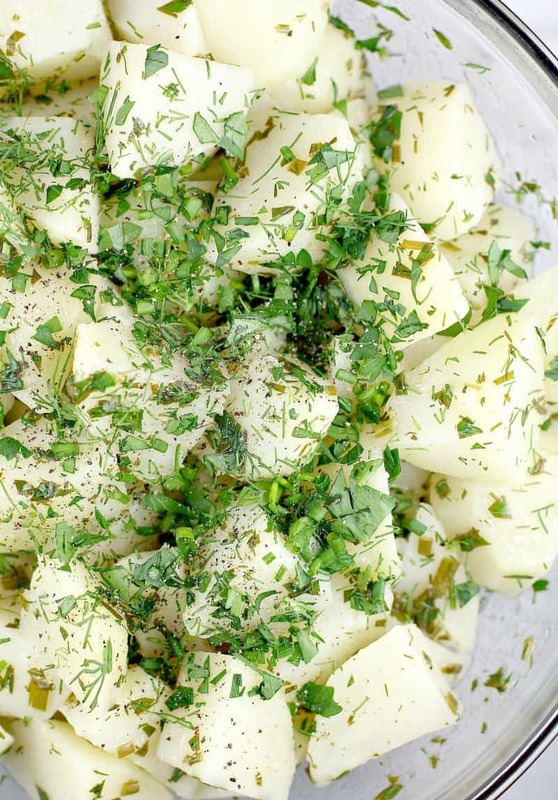 This recipe is all about the herbs, honestly, and the potatoes are just the delivery vehicle. So, Fresh Herbs. UNsalted butter. I believe this key to be crucial in all cooking, because salted butter tastes nasty, but it is especially true here. 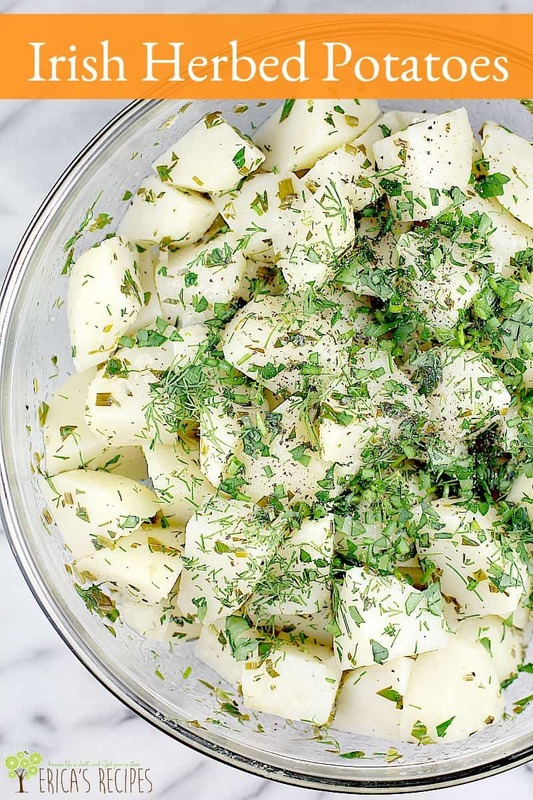 All we have going on are simple potatoes and herbs, so that dreamy sweet butter flavor is definitely what we want. So as long as we take care of those essentials, this recipe will love you for life. This is one of those loverly examples where we are making such a simple recipe, with simple ingredients – peasant food even, if you will – but with the right ingredients, this dish sings. 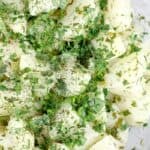 So that’s it folks, an easy boiled potato, IRISH herbed potato recipe for an easy win and delicious side dish. Make it, take it, cart it, love it. 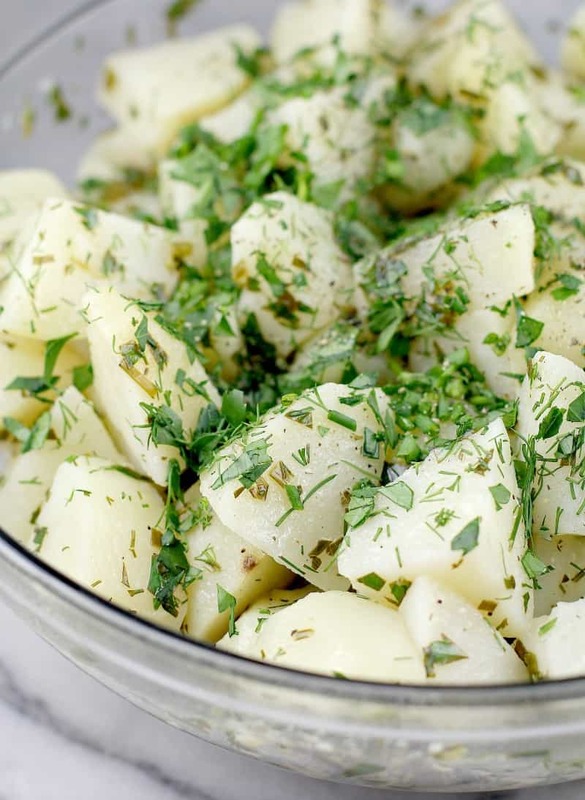 This cozy warm side dish with seasoned boiled potatoes is perfect for St Patrick's Day or any occasion to get your Irish herbed potatoes, Irish food game on. Place potatoes in a large saucepan and cover with water. Bring to a boil. Reduce heat; cover and simmer for 15-20 minutes or until just fork tender. Drain. Transfer to a serving bowl. In a small bowl, combine the remaining ingredients; pour over potatoes and toss to coat. Serve warm or at room temperature. Yields 8-10 servings. If these Irish potatoes look good, check out these other sides dishes. I will pretty much eat potatoes in any form. 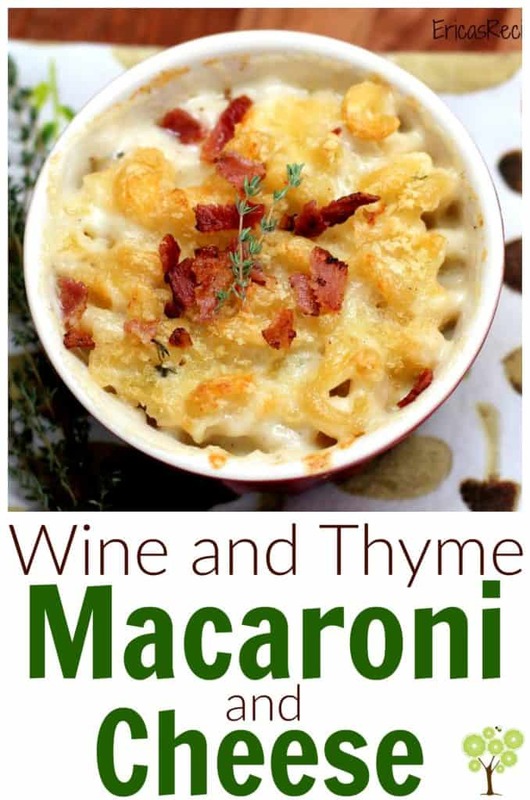 I love this recipe and I am totally trying it! Those are some delicious looking potatoes. They look like they would be the perfect compliment to any meal. These look soooo good! Love the fresh herbs and flavors in them. I can’t wait to try. I could eat potatoes every day. I haven’t had them prepared this way before, but it looks easy enough that I plan to give it a try. Yum! These look great! We don’t eat as much potatoes these days anymore, not sure why but we always enjoy them when I make them!